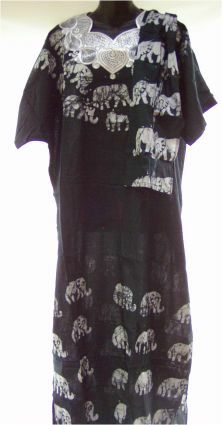 Silver Elephant is a long black 100% cotton hand block printed embroidered dress with scarf. It has 4″ of beautiful silver embroidery around the neck and a herd of marching elephants top and bottom. There are kick pleats on each side. Cool and breezy one size fits most all. It measures 28″ across the chest and 55″ from the shoulder to the hem. The scarf is 9″ wide and 36″ long, with a center vertical seam. The scarf is hemmed on all 4 edges.